Every year that I was in the classroom, I made it a point to teach two classics that I think every high school student should read- Night by Elie Wiesel and Left to Tell by Immaculee Ilbizaga. It didn’t matter the grade level (it was all high school) both of those books were a staple of my curriculum in my attempt to expose students to events that would allow them to empathize with other humans. Fast forward to 2018 and we should be a society where racism, misogyny, homophobia and the likes should be rebuked, but unfortunately, we’re not. Instead, almost daily we here daily of incidents calling their classmates racial slurs or worse throwing Nazi signals at a sacred event like Prom. According to the FBI, U.S. hate crimes increased by 17 percent last year, a surge driven by racial and anti-Semitic attacks and linked by some experts to the wider public emergence of white supremacists and other hate groups. In the last two years, we’ve seen an increase of not only national hate crimes but an increase in schools. Using the report Documenting Hate by Education Week and partner with the nonprofit news organization ProPublica they analyzed three years of media reports and self-reported incidents of hate and bias in K-12 school settings. In a review of 472 verified accounts, we found that most incidents that took place in schools between January 2015 and December 2017 targeted black and Latino students, as well as those who are Jewish or Muslim. With this bleak news, the next natural question should be what can teachers do? While the answer is complicated the simplicity in the short answer is startling (for some). 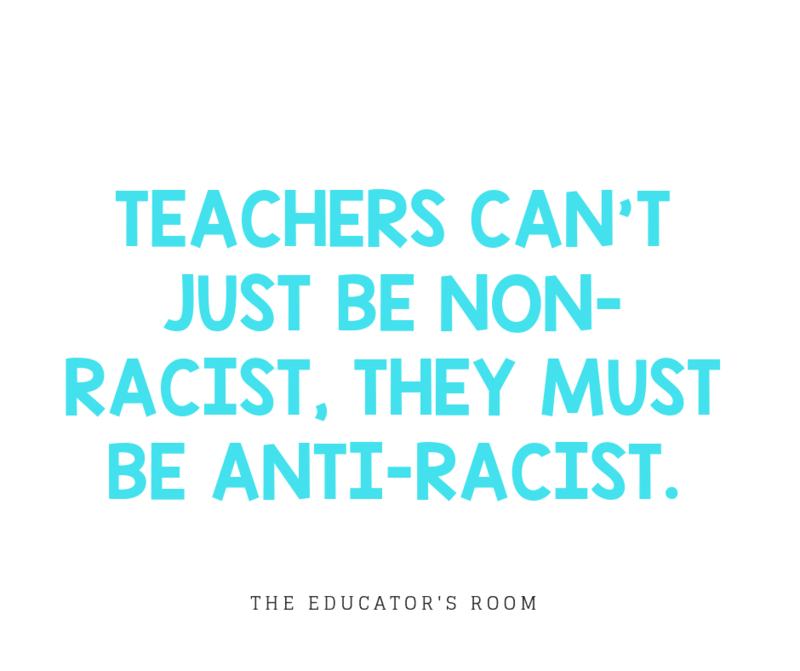 In 2018, it’s not enough for teachers to be non-racist, they must be anti-racist. According to Psychology Today, the importance of opposing prejudice (non-racist) is simply not enough and instead of being an anti-racist facilitates action where we actively oppose and fight against racism. Teachers have an important job in teaching their curriculum and attuning to their student’s social-emotional learning and part of that is making sure we stand up to racism-each and every time we’re confronted with the ugliness of discrimination. So how can teachers actively be anti-racist? Here are some quick tips to help you. See something, say something. So many times I go into teacher groups and the things people say! Whenever you see something that’s either blatant or inferred racism, call them out. Sometimes all it takes is to be educated for people to change. Other times, it doesn’t matter what you say the person will remain the same- either is fine. The point is that you spoke out. Challenge curriculum that has blatant “whitewashing” of historical events, moments, and people. This is particularly important because we know of several examples of textbooks misrepresenting key events in American history. Instead of teaching and being compliant, teach students the truth and bring in secondary and primary sources that teach what really happened. Be an ally and educate yourself on systematic racism. Talk to people who are different than you and find out ways you can be an ally. Systematic racism is what this country was founded on and it’s important that all teachers understand how they can create equitable classrooms. It could be you bringing in more diverse texts or engaging students in events from around the world that allow you to stretch what your students think they know. In Eli Wiesel’s Noble Peace Speech he famously said, “And that is why I swore never to be silent whenever and wherever human beings endure suffering and humiliation. We must always take sides. Neutrality helps the oppressor, never the victim. Silence encourages the tormentor, never the tormented.” In 2018, let’s take sides and think about ways how you can move into understanding how hate, intolerance, and bias affect school climate and impacting students and their educators.